Do you have any innovative ideas about modern sofa or comfortable couch? Most customers have their own passionate design and do not compromise quality.Therefore, they find us to achieve it. Please take a look at below custom made sofa for individual client. It is made of solid wooden frame, high density sponge and microfibre. This design of flat and sleek sofa will definitely add a touch of effortless elegance to your home and look fantastic in your living room. 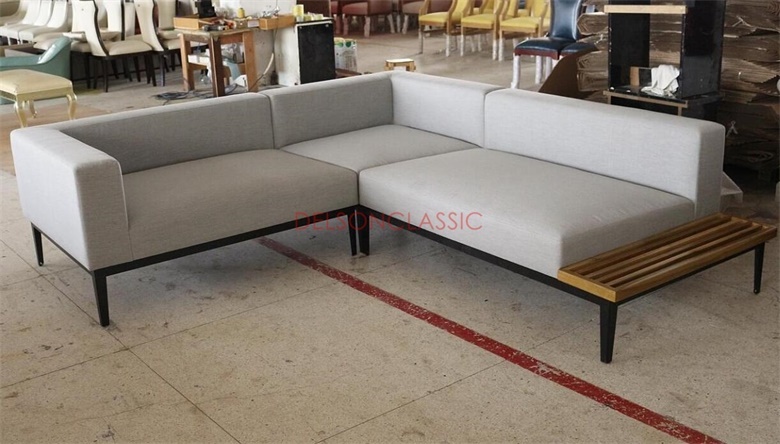 Delson furniture factory in China offers stylish contemporary furniture for every room. Guess you would find it easier to buy those affordable modern furniture, including sofas, lounge chairs, dining tables,storage and cabinets, and more. Fill your home with furniture that brings you comfort as soon as you walk in the door. Our custom built furniture choices for all kinds of clients are various, The high quality materials we have are solid walnut, solid ash, solid beech, solid teak; marble, stainless steel, aluminum, panel. Our research and production team are constantly perfecting their skills and endeavoring to make the most satisfied and quality custom furniture as your wishes.